Note: The Roost Smart Battery is now available for purchase, and my opinion has changed. Here's my hands-on review. Roost also announced that it intends to offer its own line of smoke alarms that will be bundled with its Roost Smart Battery. Here's the news on that. Roost CEO Roel Peeters thought he had a better mousetrap. Knowing how annoying it is to be awakened at 3 a.m. by a chirping smoke alarm with a dying battery, he invented a smoke-alarm battery with an embedded Wi-Fi chip that sends an alert to your smartphone before it’s drained to that level. Even better, his battery sends a message when your smoke alarm alerts you to fire. 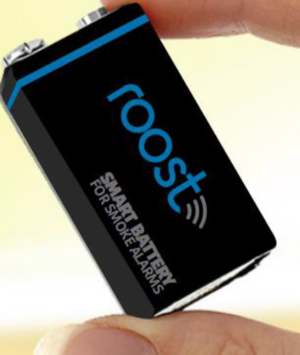 But the Roost Smart Battery’s 15 minutes of fame might have ended before it started. You see, 15 minutes ago, Leeo announced the Leeo Smart Alert Nightlight. The Leeo will also send a message when your smoke alarm goes off—but unlike a battery, it never wears out. And unlike the Roost Smart Battery, you can buy one today. The Roost can warn you of impending battery failure. That's one thing the Leeo can't do. Then again, I could be wrong. Maybe people will think Roost has the better idea after all. Let me tell you about it so you can decide for yourself. Roost’s founders—CEO Roel Peeters and CTO James Blackwell—each have 20 years of experience designing and building low-power Wi-Fi and Bluetooth chips. They clearly know their stuff. And Peeters shared some keen insight when I spoke with him last week. 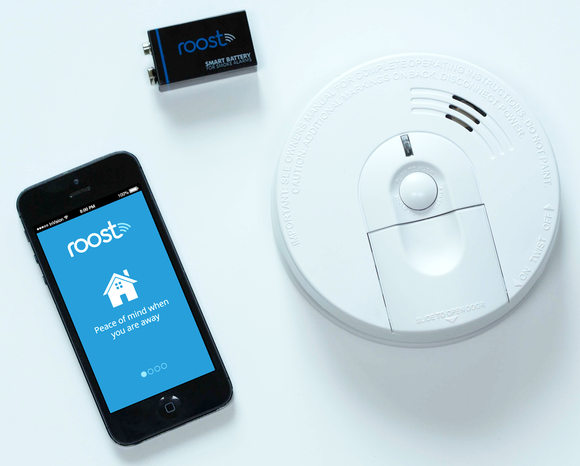 If it comes to market, the Roost Smart Battery will use a Wi-Fi connection to relay smoke-detector alarms to your smartphone. The Roost Smart Battery looks like any other 9-volt battery, but this one has embedded intelligence. That's the same idea behind the Leeo Smart Alert Nightlight. I learned about both products under the terms of embargoes, so I must presume that neither company knew what the other was developing. Now that both products are public knowledge, maybe Peeters will be able to explain why his product will be better, or at least complementary to the other. The same goes for the folks at Leeo, of course. I'll let you know what I learn from both parties. Installing a Roost Smart Battery will be a three-step process: Download the app to your smartphone, name the smoke detector it’s going into, and then select your Wi-Fi network and provide its password. The app passes that information to the battery before you plug it into the smoke detector. This will let you know exactly which battery needs to be replaced, and that's important because most homes have more than one and it can be a pain to determine which one is chirping. Informing you of impending battery failure is the one thing the Leeo can’t do. But Peeters anticipates his lithium-based disposable battery will cost $25 to $35 and last five years when it comes to market in the second quarter of 2015 (that’s assuming a successful crowd-funding campaign later this fall). My home has six smoke detectors, and one $99 Leeo can tell me if any of them are sounding off. Six Roost Smart Batteries would cost between $150 and $210 every five years. That’s a lot of cash just to avoid being awakened by a chirping smoke detector every couple of years. What do you think? Is a smart battery better than a smart nightlight? Share your insight with us in the comments section, below.